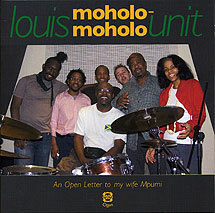 Louis Moholo-Moholo, drums, vocals; Jason Yarde, soprano, alto and baritone saxophones; Ntshuks Bonga, alto and tenor saxophones; Pule Pheto, piano; Orphy Robinson, vibraphone; John Edwards, bass; Francine Luce, vocals. Recorded November 2008 at The Premises solar powered recording studio, London. Front cover photograph (reproduced above) and design by David Ilic.